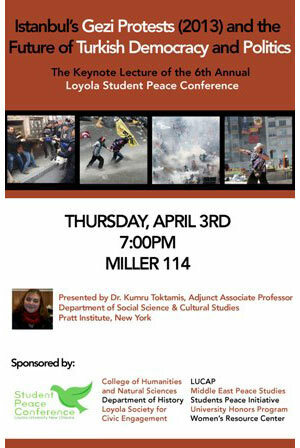 Loyola University New Orleans students present the sixth annual Student Peace Conference March 31 – April 4. The conference includes a series of panels and lectures exploring the multifaceted meanings of peace and conflict from a variety of perspectives. Lecture I: We Won. Women and Men who Courageously Stood up to Combat the Criminalization of their Lives. This lecture by Deon Haywood, executive director of Women with a Vision, Inc, is part of the Women’s Resource Center’s Brown Bag Lunch Series. Both of these lectures are presented by Kumru Toktamis, Ph.D., Department of Social Sciences and Cultural Studies, Pratt Institute, New York. Lecture IV: Killer Drones: The Vehicle of Empire? This lecture is presented by Kevin Caron of the Georgia Peace & Justice Coalition Drone Task Force. The Student Peace Conference is made possible by the participation and support of the University Honors Program, the College of Humanities and Natural Sciences, the Women’s Resource Center, the Loyola Society for Civic Engagement, the Department of History, LUCAP, the Student Peace Initiative and the Middle East Peace Studies Interdisciplinary Minor. For more information, contact the student organizer Simon Whedbee at 773-208-2529.